Locked Automatic Pill Dispenser with Tipper for Home or Institutional use. 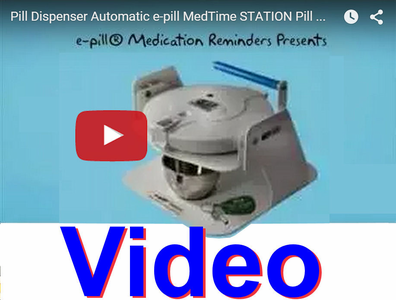 The e-pill MedTime STATION Automatic Pill Dispenser (SKU 996024 / UPC 837066002415 / www.epill.com) dispenses in medicine cup. Never forget or double dose again! Auto dispense up to 6 times per day with the new e-pill Station. Sturdy 'zero gravity' tipper included. Lockable pill dispenser (2 keys included). Dispense 1 dose per day = refill every 28 days. Four (4) times per day refill Weekly. Improve medication adherence and patient compliance with this popular e-pill Medication Reminder. Easy to use e-pill machine: Allows an aging parent (patient) to continue to live independently at home = achieve Age-In-Place / Aging-In-Place. Click below (arrow) to learn how this e-pill works! Patent Pending.